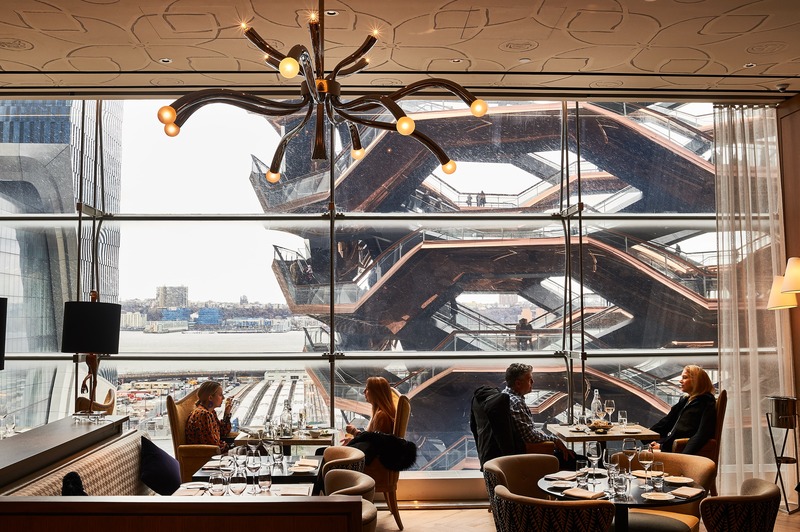 If you’ve been on Instagram in the past couple of weeks, then you know the highly-anticipated Hudson Yards complex opened for business. Locals and visitors alike can’t help but post snaps from what’s supposed to be New York’s newest and hottest neighborhood. Since I live just a few blocks south, I ventured out on opening day to see what all the buzz was about. While the chaos and crowds are certainly less than desirable, there are a few things worth checking out ASAP. A view of The Vessel at Hudson Yards is on display at Queensyard. Whether you love it or hate it, Thomas Heatherwick’s stairway to nowhere is the topic of conversation on social media. Thousands of photos of popped up of the structure from every angle. I was lucky enough to climb it on opening day, and it’s definitely worth doing at least once. The views are pretty, the pics are cool, and you get quite the leg workout. Rumor is the new Equinox will be hosting classes on the vertical masterpiece once they open. Picture this: you leave your office but have an awkward amount of time until your next meeting, train or happy hour plans. You’d ideally like to rest for a few minutes or freshen up, but you’re not close enough to home, and a coffee shop just doesn’t suffice. Enter 3DEN: the first pay-as-you-use, amenities-filled destination that meets the needs of the in-between moments of your day. It starts at only $6 for 30 min giving you access to things like Casper nap pods, a spacious lounge, a meditation room, soundproof phone booths, pristine bathrooms with private showers and more. It’s the perfect place for a break from the pandemonium. One thing I noticed from my vantage point on The Vessel was a couple of dining rooms in the mall with all-glass windows and stunning balcony space. Not even knowing the cuisine or details, my friend and I turned to each other and said, “We have to eat there.” Well, it turns out the one spot was light-filled Queensyard on Level 4. 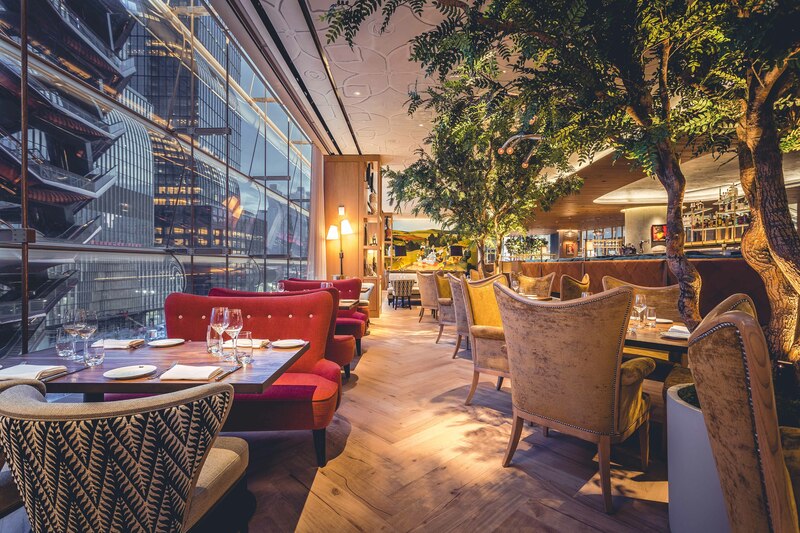 From there you can chow down on British-inspired fare while taking in unobstructed views of the Vessel. Plus, I’m a huge fan of the Queen Elizabeth memorabilia including a cocktail served in a royal goblet. While the mall covers all your basic luxury brands, there was one store, in particular, I love the most: Batch. The products for sale range from clothes and bedding to pet supplies and they’re all hand-picked to highlight smaller brands and online designers. And it’s all “presented to be like your stylish friend’s home.” They even have pieces from Insta-famous artists like Kristi Kohut up for grabs. What’s even cooler is they completely change out the store six times a year. So, there’s always something new to discover. Sure, there are other Blue Bottle Coffees throughout the city. But, if you’re interested in avoiding the crowds, grabbing up a cup of Joe from here at 7 a.m. and walking around is the perfect way to explore Hudson Yards. That’s precisely what I did with my husband and baby on a Saturday morning giving us the chance to really scope out the whole space without having to wait in line just to get on the escalator.